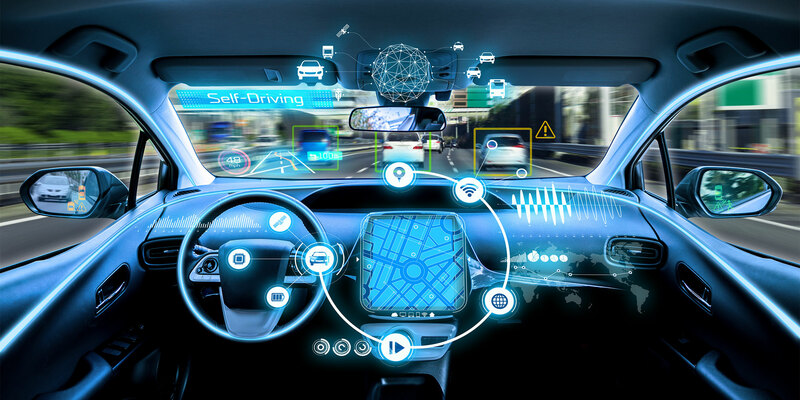 Connected cars are increasingly gaining traction, with their adoption supported by technological developments such as faster Internet speeds, artificial intelligence (AI), and innovative automobiles. 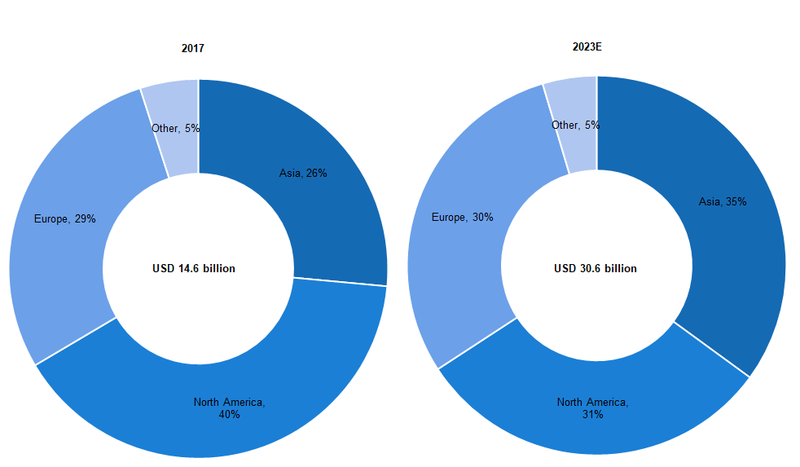 Advanced technologies are now contributing more to the value of vehicles, thereby increasing the relevance of tech firms such as Apple Inc (USA), Baidu Inc (Baidu – CHN), and Alibaba Group Holding Ltd (Alibaba – CHN) in the connected car market. By geography, China is likely to emerge the market leader for connected cars including self-driving/autonomous vehicles (AVs) by 2025E. This should be driven by its user base for automobiles, the largest globally, together with Chinese consumers’ relatively high interest in connected cars and their confidence in AV safety. The Chinese government’s aim of transforming China into a manufacturing hub for the automobile industry through its 10-year plan ‘Made in China 2025′ is another positive. While the development of connected cars should benefit car manufacturers and tech firms alike, based on consumer preference, traditional car manufacturers stand to gain in varying proportions in different markets. For instance, a Deloitte survey in 2018 noted that Chinese customers prefer new AV manufacturers over traditional ones or tech firms, while Japanese respondents preferred AVs produced by traditional car manufacturers. This dynamic is encouraging for new AV firms in China, while also supporting collaborations between Chinese tech firms and car manufacturers, domestic or foreign. Meanwhile, ASEAN’s connected car industry is also making progress. 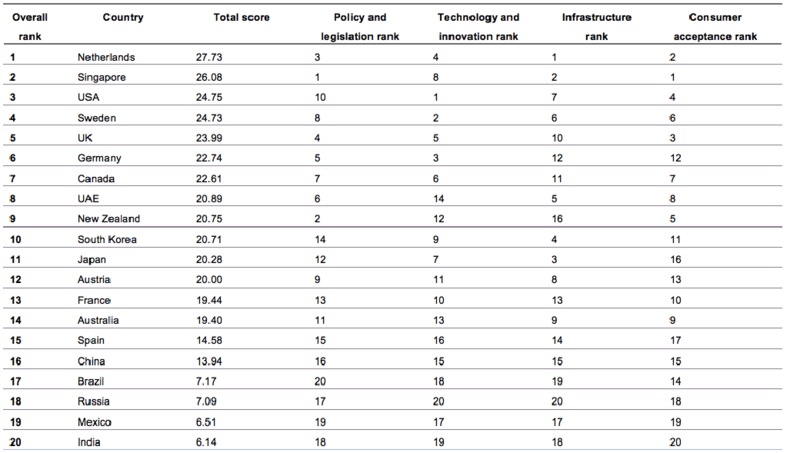 Singapore ranked second (behind the Netherlands) in the KPMG AV Readiness Index (2018), indicating potentially strong adoption of AVs in the country. However, a lack of production capacity could keep Singapore from leading AV production in ASEAN. Instead, Malaysia is likely to lead, given a more conducive regulatory environment and infrastructure to develop AVs, even though it is only the third-largest automaker in ASEAN at present. Although the adoption of connected cars should remain positive, questions regarding their operational safety, data privacy, and susceptibility to hacking could hinder adoption worldwide. Connected cars refer to vehicles in which various Internet-based devices are interconnected, either with each other within the car or with devices elsewhere. Connected cars are paving the way for the adoption of AVs. Connectivity in cars can be broadly classified into four areas: Vehicle to Vehicle (V2V), Vehicle to Infrastructure (V2I), Vehicle to Pedestrian/Phone (V2P), and Vehicle to Everything (V2X). The concept of connected cars emerged in the latter part of the 20th century (1996) and has been gaining popularity as continued technological progress increased its capabilities. Statista (based on data from Accenture) noted that around 35% of new cars sold globally in 2015 were Internet-connected, and also forecasted that sales will reach about 98% by 2020E and 100% by 2025E. However, connected car components currently play an insignificant role in the value of cars. Estimates by Statista and IBISWorld (a market research provider) imply that the connected car components market generated less than 1% of overall car and automobile manufacturing revenue in 2017. 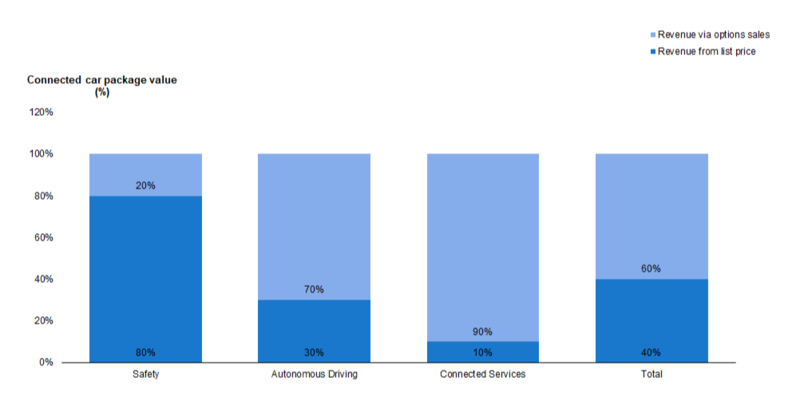 Moreover, as per PwC estimates, autonomous driving is projected to expand the fastest among connected car features, at a 31.0% CAGR over 2015–22E (vs. 23.5% for overall connected cars during the same period) and to increase its share to around 35% of connected car revenue by 2022E (about 24% in 2015). Moreover, Forbes (based on forecasts by The Boston Consultancy Group) noted that fully and partially autonomous cars could increase their stake to around 25% of total car sales by 2035E (from around 1% in 2016). 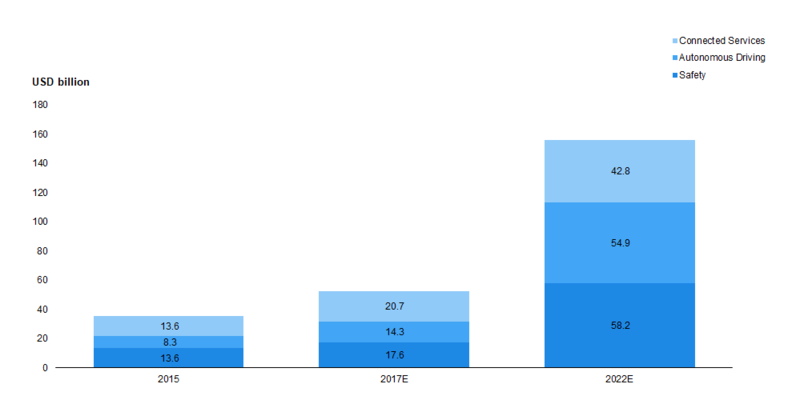 Moreover, as connected cars gain popularity, software and technology for vehicles form an increasingly larger proportion of vehicle revenue. This should reduce revenue generated by traditional means (vehicle sales, aftersales, financing, and insurance, among others). PwC forecasts that the combined revenue of shared mobility and digital services as well as new technology and software will increase to around 17% of total auto industry revenue in 2030E from around 3% in 2015. The shift in the automobile industry mix towards connected cars could support the entry of technology-based firms. Traditional automakers lack the skills and flexibility required for developing or improving connected car offerings on their own, and therefore need to form strategic partnerships with technology suppliers. For instance, automakers such as Honda Motor Corp Ltd (Honda – JPN) have partnered with a range of tech firms such as Alibaba Group Holding Ltd (Alibaba – CHN) and Neusoft Corp (CHN) to further their progress in connected cars including AVs. However, certain leading technology firms might attempt to go beyond simply providing systems and technology for connected cars and instead launch vehicles of their own. For instance, Apple Inc (Apple – USA), which already provides connectivity systems (Apple Car Play), intends to launch its own AV. In addition, the telecommunications industry plays a leading role in enabling the existence of connected cars, as connectivity requires faster Internet speeds, facilitated largely by 5G technology. Some industry players are therefore now looking to capture the opportunities presented by connected cars. For example, telecommunications equipment provider Qualcomm acquired NXP Semiconductors NV (NLD – a chipmaker for the automotive industry) in order to increase its own product offering for connectivity in automobiles. Statista forecasts that sales of connected car systems will grow the fastest in Asia, at a CAGR of 18.5% over 2017–23E (vs. a global CAGR of 13.1%). 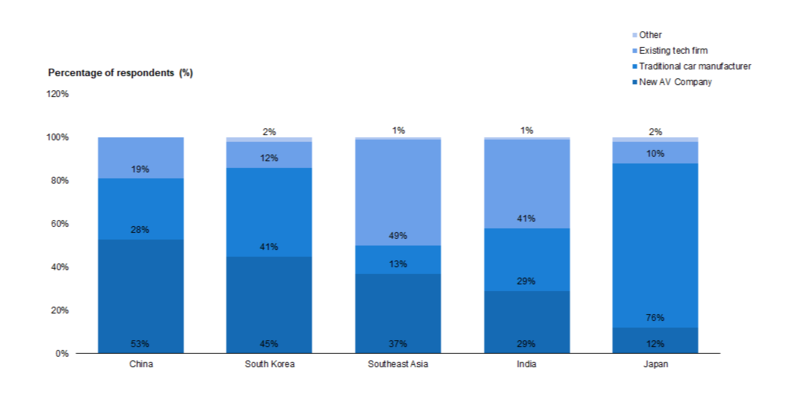 As per the same forecast, Asia should be the largest market in the industry by 2023E, making up 35.0% of industry sales (and North America the second-largest market; share of 30.8%). This is likely due to the growing use of connected cars in China, driven by a large user base and growing popularity, coupled with strong regulatory support. By 2030E, Deloitte forecasts China to have around 299 million connected cars and 33.1 million AVs, respectively around 2.0x and 1.6x the next largest market’s — the USA’s. China was the largest automobile market in the world, with sales of 29 million units in 2017 (1.7x the USA’s), as per Statista. However, as per Deloitte, it had only 0.9x the number of connected cars owned in the USA, indicating lower penetration. Chinese customers’ interest in connected cars and AVs further support domestic demand. A Deloitte survey in 2017 highlighted that interest in full AVs was relatively high (more than 50% of respondents were interested — the highest rate globally) among Chinese customers of all ages (baby boomers through Y/Z generations). Interest was even higher among the younger generations: around 64% of Generation Y/Z respondents in China showed interest versus 57% of pre/baby boomers and 60% of Generation Xers. China has relatively young premium car owners, and this is evidence of the strong interest in automobiles among its younger generations. As per news provider Straits Times, the average age of Mercedes Benz buyers in China in 2016 was 37, versus over 54 in the USA. Further, Chinese consumers show higher confidence in the safety of AVs. A Deloitte survey in 2018 noted that only 26% of respondents felt that self-driving cars are not safe, compared with 57% in Japan and 47% in India. Moreover, the share of respondents in China that deemed AVs unsafe dropped from around 62% in 2017, as per Deloitte’s surveys. The connected car market in China is also likely to be supported by significant investments and government policies. As part of its 10-year plan ‘Made in China 2025′ (initiated in 2015), the government announced intentions to transform China into an innovation hub in the auto industry. The Ministry of Industry and Information Technology (MIIT) thereby also intends to reduce accidents, emissions, and energy consumption. Moreover, China’s central government mandated that 50% of all new vehicles sold in the country should have partial or full autonomous functions by 2020E. This is similar to the timeline of the Japanese government, which intends to launch a self-driving car service for the 2020 Olympics before commercialising the system by 2022E. The Chinese government’s plans are facilitated by significant investments and regulations in relation to connected cars. For instance, it is issuing permits to non-traditional auto manufacturers, subsidising electric vehicle (EV) purchases and allowing road tests for self-driving cars (banned in the past) in key cities such as Beijing. The Chinese government also invested in artificial intelligence (AI) during 9M2017 (AI technology is typically embedded in connected cars). Meanwhile Chinese search engine giant Baidu Inc (Baidu – CHN) invested in 100 autonomous driving projects over 2017–20. Further, the Chinese connected car market should also benefit from the Chinese government’s plan to develop smart cities and the increase in public charging ports in the country. In KPMG’s AV Readiness Index in 2018, China ranked 16th, behind the Netherlands (1st), the USA (3rd), and Japan (11th). However, government initiatives, investment, and changes in customer perception could change this in the future. With regard to consumer trust in relation to AVs, a survey by Deloitte in 2018 highlighted that around 53% of Chinese respondents trusted new AV companies, while around 76% of Japanese respondents trusted traditional car makers (versus around 28% of Chinese respondents). 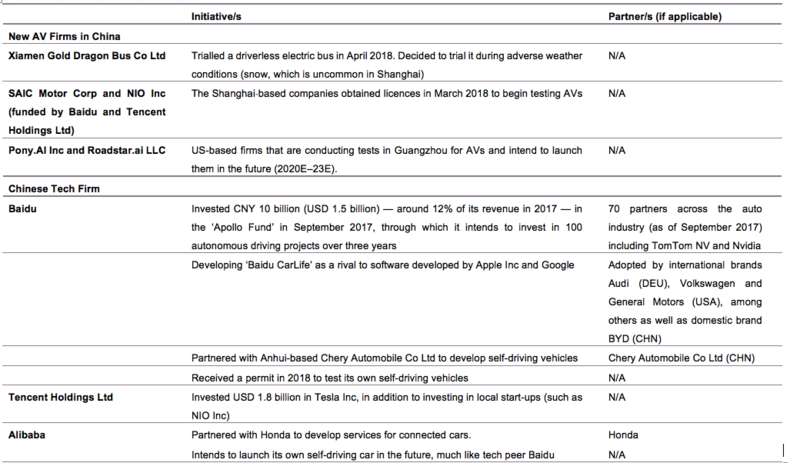 This indicates that Chinese AV start-ups are likely to benefit more than traditional auto manufacturers, as will the tech firms that partner with car manufacturers. In contrast, in Japan, traditional automakers are likely to gain more than new players, should they invest in developing AVs. Given this dynamic and the strict regulatory restriction of access to foreign-manufactured apps (e.g. Google Maps) in China, Chinese technology firms (e.g. Baidu and Alibaba) are most likely to partner with foreign and domestic automakers to develop AVs. This should also provide foreign automakers a means of entering the growing Chinese market. Such partnerships are especially useful under the current regulatory regime in China, where foreign automakers are required to set up joint ventures (JVs) with Chinese firms (with foreign ownership capped at 50%); however, this regulation is expected to be lifted by 2022E. Japanese firms Honda, Toyota Motor Corp (Toyota), and Nissan Motor Co Ltd (Nissan) continue to invest in R&D, while also forming strategic partnerships to develop connected car-related technology as well. For instance, as per Statista, Honda invested 4.9% of revenue in R&D in 2017, incidentally the third-highest in the world, behind Tesla Inc (USA; 11.9%) and Volkswagen AG (DEU; 5.3%). It also partnered with Alibaba in 2018 to develop services for connected cars. Singapore’s well–developed infrastructure and regulatory backing for AVs should support the country’s role of early-adopter of AVs among ASEAN nations. As per KPMG, Singapore ranked second in the world (behind the Netherlands) in terms of AV readiness, driven by its regulatory support and consumer acceptance. Moreover, the Singaporean government intends to have autonomous buses on the road by 2022E. News and research provider CIO Asia noted that Singapore is a hot bed for start-ups that intend to launch AVs. However, given the absence of mainstream car production in the country at present, Singapore will probably remain a key market for innovation, although it is unlikely to emerge a leading manufacturer in the long term. Malaysia, the third-largest manufacturer of automobiles in ASEAN, seems to be the most likely leader in AV manufacturing. Malaysia accounted for around 12% of cars produced in ASEAN in 2017, behind Thailand (49.2%) and Indonesia (30.1%). However, Thailand and Indonesia suffer from low customer interest and regulatory support for AVs (for instance, Thai regulations prohibit the testing of AVs in public), together with high levels of congestion and relatively inadequate infrastructure. Such limitations for the top two producers could leave an opportunity for Malaysia to emerge a leader in AV production, given the support it has for AVs. The presence of firms such as REKA (which has tested AVs on roads in Malaysia, from Kuala Lumpur to Melaka) and the government’s R&D programme through 2025E to capitalise on advancements in AV technology should help the country expand AV development and production. Moreover, the Malaysian government has even in the past shown willingness to alter legislation to allow technological progress. For instance, it amended the Land Public Transport Act 2010 and the Commercial Vehicles Licensing Board Act 1987 in order to legalise e-hailing services. Connected cars and AVs may continue to face issues from sluggish customer adoption due to scepticism about the safety of vehicles, data security, and the risk of vehicles being hacked (a cyber security issue). Vehicle safety remains a key concern among customers in all regions, as highlighted above, albeit less of a concern in China. However, as per PwC estimates, connected car revenue attributed to safety should rise at a CAGR of 27.0% over 2017E–22E (outpacing the overall connected car revenue CAGR of 24.3%); this indicates producers’ attention to these safety concerns. Moreover, PwC estimated safety components generated around 80% of revenue from the list price in 2016 (overall connected car sales generated only 40% from the list price, and the remainder from options sales), further indicating that safety remains a necessity. Management consultancy firm McKinsey & Company (McKinsey) noted that cyber security and data privacy were key concerns among customers across the globe. In its surveys in 2014 (latest available), around 54% of respondents feared their vehicle being hacked, while about 37% of respondents cited data privacy concerns. Notably, Chinese respondents were less concerned: about 53% feared being hacked and only around 21% cited privacy concerns. Connected cars offer a range of benefits and are likely to be the next major shift in the automobile industry. However, their effective roll-out is subject to certain conditions. Growing Internet speeds are the main prerequisite for connected cars, which are heavy users of data, requiring substantial Internet speeds. As per the World Economic Forum (WEF), every eight hours of driving an AV could generate around four terabytes (TBs), the equivalent of storing over 1.2 million photos. In addition, a one-second latency in Internet speed (largely acceptable for other apps) could cause deadly accidents in AVs. PwC noted that 5G networks should effectively be necessary, being around 100x faster than current LTE technology. Baidu completed China’s first autonomous driving road test via a 5G network. 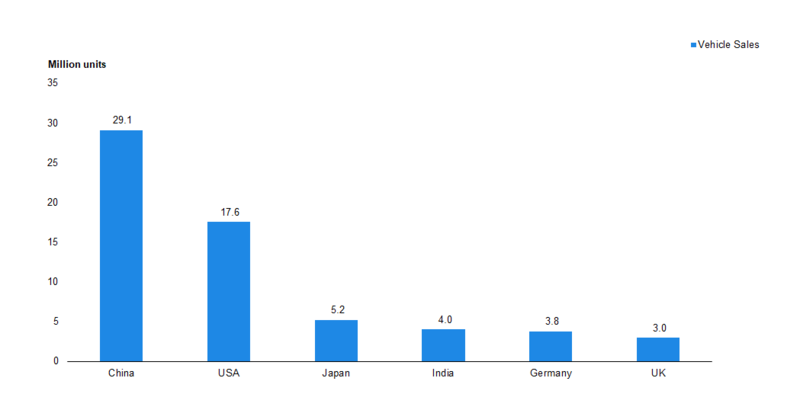 The data speed prerequisite bodes well for Asia, given that South Korea, China, and Japan are set to launch 5G commercially in the early 2020s. This should be supported by the growing involvement of regional vendors such as Huawei (CHN), ZTE (CHN), and Samsung (KOR) and telecommunication networks including China Mobile (CHN), SK Telecom (KOR), and NTT Docomo (JPN), among others.